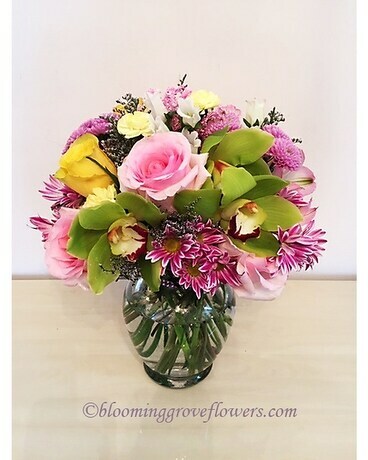 This delightful arrangement of cymbidium orchids, roses and spray chrysanthemums is sure to warm anyone's heart. Pink roses and orchids are beautifully arranged with yellow mini carnations in a graceful glass vase that’s wrapped in a pretty pink ribbon. Approximately 12" X 14" H. Flowers and Containers subject to change based on season and availability. However we will create something similar using products with an equivalent value: we will find substitution to assure the best quality and presentation for your special gift. Thank you.